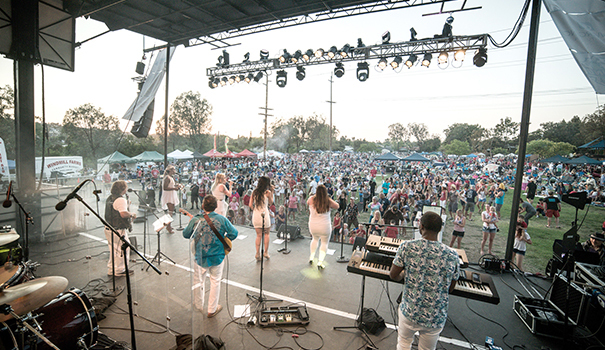 The ensemble Republic of Music will headline the 2019 Lake Murray Fireworks & MusicFest, bringing top-40 dance music to the patriotic crowds set to pack Lake Murray Community Park this Fourth of July. Event organizers have so far raised more than 20 percent of the $85,000 in funds needed to hold the annual family-friendly event. Stormberg Orthodontics is, once again, the title sponsor and additional business sponsorships are being sought at levels priced from $500 to $7,500. Individual $50 donations from neighboring households are also being sought. “The fireworks show and the music festival really brings together the local community like no other event can,” said Dr. Kurt Stormberg, who practices in La Mesa and lives in the Del Cerro community. The 11 a.m. to 9 p.m. music festival draws a rotating crowd of more than 3,000 people, while the 9 p.m. fireworks show can be seen by an estimated 100,000 people throughout La Mesa and San Diego’s Navajo neighborhoods of Grantville, Allied Gardens, Del Cerro, and San Carlos. Food vendors lined up for the 2019 event include Finest City Kettle Corn, Primos Mexican Food, Windmill Farms, and Corbin’s Q barbecue. The day’s festivities also include games for the kids. This is the third consecutive year for the Lake Murray Fireworks & MusicFest event following a six-year hiatus. The volunteer committee behind the event works all year to fundraise and promote the event on social media and with informational flyers delivered door-to-door. The next canvassing effort is set for 9 a.m. to noon Saturday, April 13, with volunteers meeting at Lake Murray Community Park. Business sponsors receive recognition on the Lake Murray Fireworks & MusicFest website and social media platforms, as well as prominent signage at the event, Kern said. Funds raised cover the expense of fireworks, city permits, insurance, emergency personnel, portable toilets and sinks, entertainment, and lighting and stage components. To donate, go to bit.ly/2Ufr4MR. For more information about the event, visit lakemurrayfireworks.org. — Tracy Dahlkanp is event chair for the Lake Murray Fireworks & MusicFest.